UFV Library is ending its subscription to RefWorks as of July 15, 2015. Existing accounts will automatically expire on this date. Please read on for important information about migrating your RefWorks data to a new system. As of June 2015, the Canadian version of RefWorks will cease to exist, because the Canadian server that hosts RefWorks is no longer available. This comes at a time when the UFV Library’s budget has been reduced significantly, and the UFV Library has made the decision to discontinue its subscription to RefWorks altogether. Are any of these on Canadian servers? The UFV Library has been unable to identify any citation management products that store data exclusively on Canadian servers. Popular competitor products like Mendeley and Zotero all store their data on non-Canadian servers. Your decision to share your personal data with any of these services is completely voluntary. If you are worried about privacy, you might want to consider using desktop software, like Endnote or Word (but be careful not to use their cloud or web-based features, as these will require storing data on non-Canadian servers). If you are an instructor at UFV, you must not mandate the use of any non-Canadian hosted bibliographic management system in your courses. BC's Freedom of Information and Protection of Privacy Act (FIPPA) requires that use of systems located outside of Canada must be with prior written consent if the user has to provide personal information. If using bibliographic citation tools in a course is necessary, please consult the Teaching and Learning Centre about how to be privacy compliant. How do I transfer my RefWorks data to another service? For other systems, the exporting piece will be the same, but you’ll need to consult the documentation for the system for instructions on importing. I use RefShare – will I still be able to share my data with others? If you are using the RefShare options within RefWorks and you have not heard from us already, please contact Colleen Bell (x4396 or colleen.bell@ufv.ca) immediately to discuss the best options for continuing to make your RefShare database available. Please contact the library at refabby@ufv.ca – we will be more than happy to answer your questions or help you find a solution. Coverage and subject title lists are available here. Visual Arts' professor Brenda Fredrick is excited to show the work of her VA115 students. 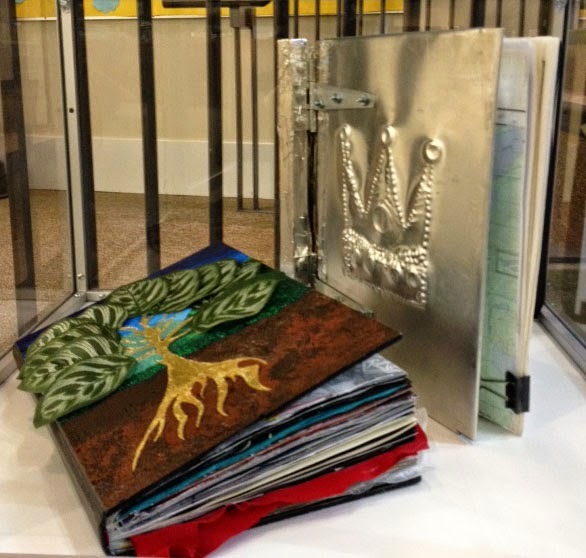 Visitors to the Abby library will see a display of the Altered Book Project, whereby Brenda's students have integrated concepts, drawings, notes, articles, resource information, influences & research related to their inquiry assignments and projects. 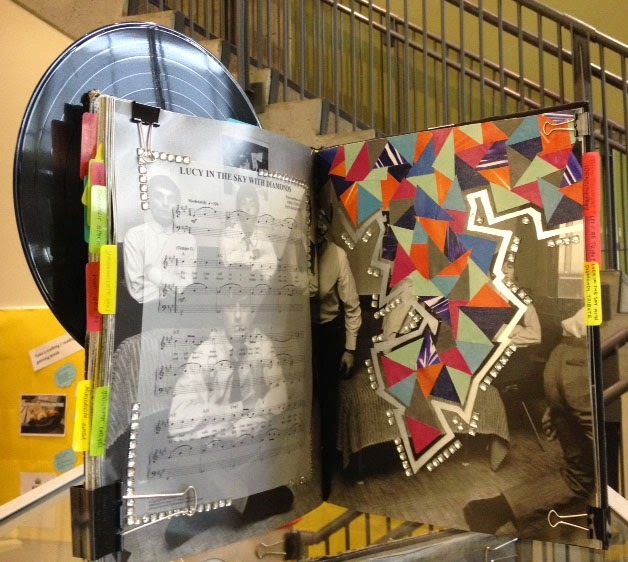 Sources such as books, videos, lyrics, films, websites, ISBN #’s, poetry, cut-out images, quotes, to-do lists, receipts, calendars have been used to create a book that stands on its own as a work of art. Also on display near the library entrance are two sculptural works by students Gen Aruga and Alisa Peleshytyk. Printing or adding value to cards will not be available before 10:00 am on Monday, April 27 in Abbotsford or Chilliwack libraries, bookstores or the campus card office. The printing/adding value system is scheduled for maintenance service on April 27, 2015. We apologize for any inconvenience. The Chilliwack library will be closed Tuesday, April 28 for a staff retreat. The Abbotsford library remains open on April 28 from 8:30 am to 4:30 pm. Beginning Sunday, April 26, UFV library hours will change in preparation for the summer semester. Both Abbotsford and Chilliwack campus libraries will be closed Sunday, April 26 and open 8:30 am to 4:30 pm Monday, April 27 to Friday, May 1, with the exception of Tuesday, April 28, when the Chilliwack library will be closed. Both libraries will be closed Saturday, May 2 and Sunday, May 3. Beginning Monday, May 4, the Abbotsford library will be open Monday to Thursday, 8:30 am to 7:30 pm, Friday 8:30 am to 4:30 pm, Saturday 1 to 5 pm and closed Sundays and statutory holidays. The Chilliwack library will be open Monday to Friday, 8:30 am to 4:30 pm and will be closed weekends and statutory holidays. In addition, beginning in August, the Abbotsford library will only be open until 7:30 pm Mondays and Thursdays, and will be closed Saturdays in August and Saturday, September 5. Classes and regular fall semester hours resume Tuesday, Sept 8. For updated library hours, please click here: http://www.ufv.ca/library/library-hours/. Connections have been restored to our EBSCO databases. The problem was caused yesterday by issues with a large Internet Service provider in the U.S.
We are currently having a problem connecting to all our EBSCO database products, including the EBSCO Discovery Service ("Articles and More".) The problem has been reported to EBSCO Technical Support and they are looking into the issue. In the meantime, you can use of Research Databases menu to connect to databases from other vendors, such as Proquest, Gale and OVID. Please call us if you require any assistance. Askaway, UFV Library's virtual reference service, is now closed for the Winter semester and will re-open on Tuesday, May 19th at 10:00am. AskAway is a chat service provided by post-secondary libraries across British Columbia and Yukon in collaboration with British Columbia Electronic Library Network and BCcampus. It provides reference and other library assistance to learners, educators, and researchers in BC and Yukon. Mac made a big impression! 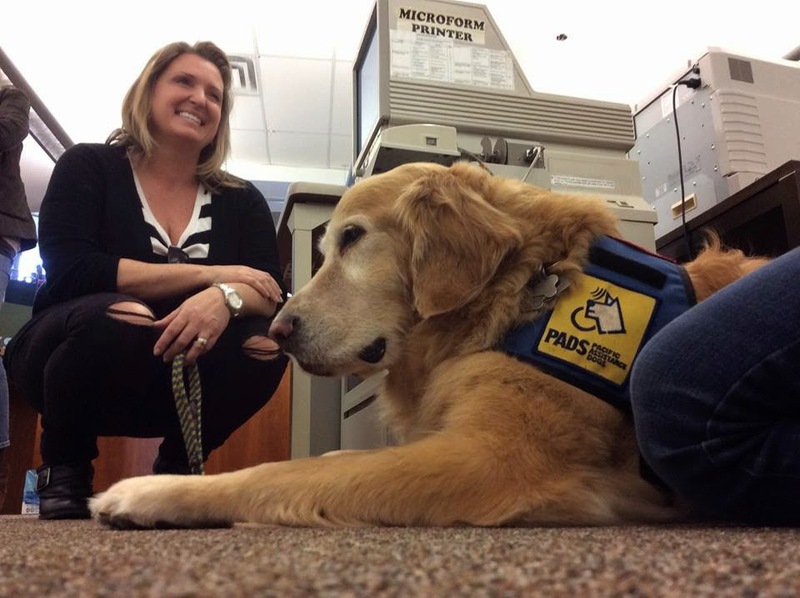 The Abbotsford library held its first "C is for calm, cookies and cuddles" day on March 26th for students and staff to take a few moments to relax and enjoy some games, treats and time spent with UFV's therapy dog, Mac. It was an outstanding event and we want to say thank you to all who participated and spent time with us in the library (and the star of the show)! If you are in need of support during difficult times, please contact UFV's Counselling Services for information and assistance.